The following is a Q&A just posted to the Princeton University Press website and blog. What makes monarchs and milkweeds so special? AA: Monarchs and milkweed are remarkable creatures, they’re on a wild ride! From the monarch’s perspective, its only food as a caterpillar is the milkweed plant. This makes them highly specialized, highly evolved, and very picky eaters indeed. They’re actually not that unique among butterflies, but they are extreme. Milkweed does everything in its power to defend itself against being eaten by monarchs. They make sandpapery leaves, toxins that can stop a human heart, and a thick poisonous goo that can glue an insect’s mouth shut. Again, although milkweed is not unique among plants, it is extreme. In what is called a coevolutionary arms race, monarchs and milkweed have been continually evolving over the eons to keep up with each other. As such, they have a lot to teach us about the way nature works, the way plants and animals interact, and about the various paths that evolution can take different species. And this is all to say nothing of the monarch’s spectacular annual migration, often over 3,000 miles flown by individual butterflies, using the sun to navigate, and having stored away milkweed’s poisons to protect themselves from being eaten by birds. Monarchs and milkweeds are royal representatives of all interacting species. AA: After studying monarchs and milkweed myself for over 15 years, I felt like I had a lot I wanted to share, especially with non-scientists and nature lovers. Monarchs and milkweed are such fascinating organisms, and yet so much of their beautiful biology is not widely known. I also wrote the book because there are areas of my own knowledge about monarchs and milkweed that I wanted to immerse myself in, but that I had not yet done any research on. So as an author, getting to visit the overwintering sites in Mexico, to study the population decline of monarch butterflies, and to understand their mating rituals were all fascinating detours from my everyday research life at Cornell University. The book was incredibly fun to write, and getting to work with artists and historians made it all the more rich. I hope that anybody that has an appreciation for nature, an interest in science, or just a curiosity about the ecology of plants and butterflies will enjoy this book. Working on this project has surely altered the course of my own research, the classes I teach, and how I see the natural world. Why have you highlighted some of the personalities of the scientists studying monarchs and milkweeds in this book? AA: One of the most amazing things about monarchs and milkweeds is the scientists who have studied them. They were such remarkable characters, especially those pioneering studies back in the 1950s: tremendously creative, sometimes competitive, and with some of their discoveries worthy of a Nobel prize. Getting to know them, both from their discoveries and their personalities, and how they interacted, has enriched my appreciation for how science is done. It also highlights the meandering and sometimes serendipitous nature of discoveries. I wanted to share the thrill of science, its ups and downs, and the process by which it is done with the curious reader. Can you share one of your ah-ha! moments from studying monarchs and milkweeds? AA: One of my favorites was from when I was an assistant professor at the University of Toronto. One day I was eating lunch by myself in a small downtown garden. Just by chance, I happened to sit on a bench beneath a very tall milkweed plant that had a very large monarch caterpillar feeding away. Without giving away all the details, that one hour encounter, in the middle of a city with 3 million people, changed my perspective on monarchs and milkweed forever. It was so unlikely an event, perhaps 1 in a 1,000 that a butterfly had been flying by and happened to lay an egg on this Toronto milkweed, and then a further 1 in 100 chance of that egg hatching and surviving to be that large caterpillar that I could watch it. And probably a 1 in a million event that I would happen to be eating lunch there, that day, to observe the events. In biology one has to work hard, be patient, and occasionally get very lucky! Throughout my studies on monarchs and milkweed, I have had tremendous luck in encountering wonderful biology that has had profound consequences. Is the monarch butterfly going extinct? AA: The answer to this very important and timely question is both simple and complex. On the simple side, there is no way the monarch butterfly is going extinct anytime soon. 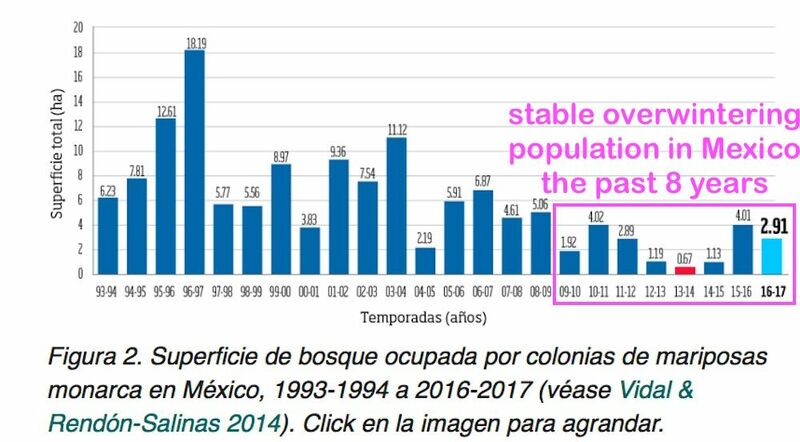 Having said that, the butterfly, and especially the long-distance migration that occurs every fall from Southern Canada and the USA, all the way to Mexico’s highlands in Michoacán, is indeed declining at a rapid pace, and we should all be worried about the sustainability of the annual migration. There’s so much information and misinformation floating around in the news these days about the causes of the monarchs decline. What I’ve tried to do in the book is outline the best knowledge that we have to date and to examine the facts critically, so we can really understand what might be going on. Unfortunately, we don’t have all the answers, but we can reject some of the most prominent explanations for the population decline of the monarch butterfly. As I argue in the book, planting milkweed certainly won’t hurt, but it is unlikely to save the monarchs annual migratory cycle. It is perhaps ironic that I spend eight chapters of the book discussing and detailing the importance of milkweed for monarchs, and nothing could be more true than their intertwined and intense evolutionary battle, but at this stage, and thinking about their conservation, it does not appear that milkweed is what is limiting the monarch’s population. Monarchs will persist for a very long time, but given that they are migratory butterflies that taste their way across North America, their declining population is something we must try to understand. Much more than the monarch is at stake, these butterflies are sentinels for the health of our continent! If the availability of milkweed is not the reason for the monarchs decline, what is your best theory for their decline? I planted milkweed last year and have attracted a pair of monarchs-I was so excited! When do they lay eggs? When would the caterpillar be ‘born’? Thank you! The decline occurred mostly between 2004-2008 – the years upper midwestern farmers were adopting herbicide tolerant corn and soybeans which resulted in the near elimination of milkweed plants that used to grow inside those crop fields. By 2009 the milkweed in the fields was nearly all gone and since no further serious damage has occurred to the milkweeds that still grow along the farm roadsides bordering the GMO crop fields, the monarch overwintering population in Mexico has exhibited stability since then and should continue to do so for the next 10+ years. The data are the data, and I agree with them… so I suppose it comes down to the statistical definition of stability and the specific time frame one chooses. We need to be careful not to arbitrarily choose a starting or stopping year. Having said all of that, I hope the population remains stable.